Thanks for the tip, Geek Tyrant! An Unexpected Journey is causing an unexpected problem with some early viewers, perhaps because they ate a big dinner or caught a bug before the show! 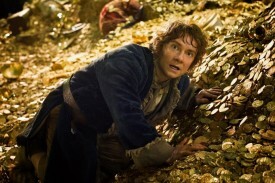 The New Zealand Herald reports that fans checking out The Hobbit’s New Zealand premiere (those lucky dogs) have had issues with nausea, dizziness and migraines caused by the faster-than-usual frame rate. Typically, films run at a rate 24 frames per second. But to make The Hobbit freakishly sharp, Jackson opted to adopt the experimental 48 frames per second. The director has been raving about the frame rate bump for much of the film’s development, with the biggest advantage being that it cuts down on motion blur for effects. For most fans it won’t even matter, as only a small number of theaters will show the film at 48 frames per second, as the studio tests the market for the new effect. But for those lucky enough to catch it as Jackson intended, you might want to make it a light meal before heading in.